1955-1958 Gibson Les Paul case, all original latches, hinges, and feet. There is some wear to the exterior of the case top lower bout and the top neck, but it is still structurally sound to keep your Les Paul. The interior is clen with no stain, rips, tear, or unpleasant odors. All in all, a solid, viable case that would make a great home for your Gold Top Les Paul. 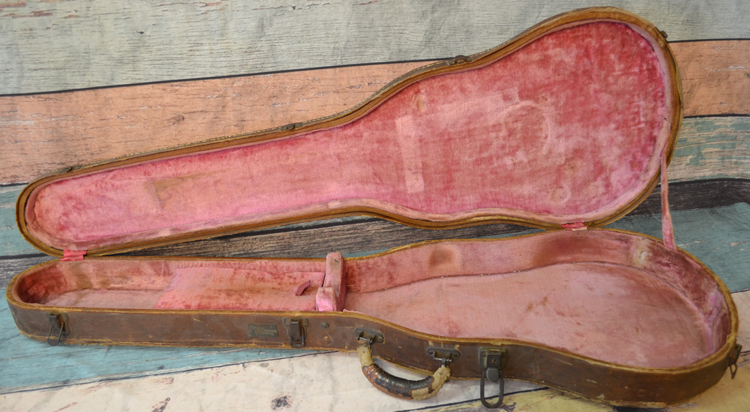 Interested In This '55-'58 Gibson Les Paul Standard Case? Click The Product Inquiry Below For Purchase Details. Did you purchase the '55-'58 Gibson Les Paul Standard Case? Feel free to submit a review. Reviews will be posted pending submission review and approval. Hampton Development © 2004 - 2019 Rare Guitar Parts All Rights Reserved.